We build each ServeWell® unit with heavy-gauge steel, and engineer the body, legs, and base for strength and durability. The complete line of ServeWell® food tables are designed to eliminate the frustrations you have had with traditional food service units. serving equipment. 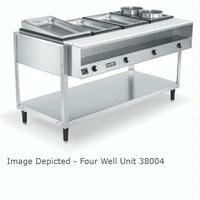 The heart of this revolutionary line is the Hot Food Table, available in 2-, 3-, 4-, and 5-well configurations. Thermoset Fiber-Reinforced Resin Wells – self-insulating and maximum energy efficiency. Thermoset Wells – clean easily by wiping off water deposits from the non-metallic surface. Thermostatic Heat Controls – automatically adjust for water temperature and food volume changes to reduce food waste. Capillary Tube Thermostats control suppy power only when needed for maximum power efficiency. Dome Heating Elements use up to 25% less energy and concentrate energy into the wells. Non-stick Surface on elements prevent scale build-up for easy cleaning and longer operating life. Elements are cast-in for longer service life and greater energy transfer. Wide no-drip lips on wells keep top surface dry. Wells are equipped with individual brass drain valves. Recommend using up to 4" deep food pans – standard and fractional sizes. 7-1/2" wide plate shelf standard. 8" wide x 3/8" thick polyethylene NSF-approved cutting board standard. Mechanical guards on all controls and power switch for safety and reliability. 10ft. power cord bottom-mounted to stay out of they way. Stainless steel construction includes legs and undershelf. Standard adjustable stationary legs or optional caster set for additional cost - 38099 Caster Set – 4" swivel wheels with brakes.